What do I need to know about Breach of Contract Litigation? Contracts are an essential part of the foundation of our society, whether we like it or not. No matter who you are, we all enter into contracts and we all depend on the ability to uphold our contracts. If you are an individual and have purchased tickets for a movie or concert, you have had a contract with the theater. If you are a small business restaurant owner, you likely have contracts with food suppliers. If you are a corporation, you might have a sophisticated licensing deal for your intellectual property. Regardless of the size and sophistication, a contract is simply an agreement between two (or more) parties. Each party agrees to perform and carry out the terms and conditions stated in the contract. These agreements are made enforceable through the law. A breach of contract occurs when one party fails to fulfill any designated obligations under the contract. Such a breach can occur, depending on the specifics of the contract, when a party fails to perform on time, does not perform in accordance with the terms of the agreement, or does not perform at all. If this happens, then the non-breaching party may file a lawsuit and seek legal relief. 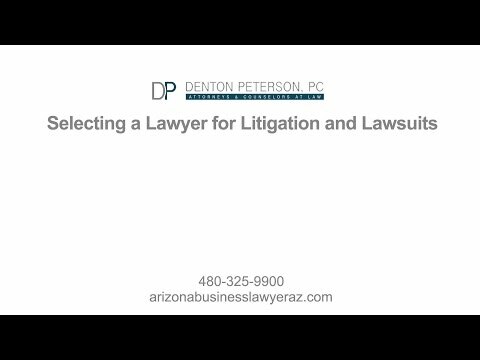 Call Denton Peterson to talk with an experienced Arizona litigation lawyer about your needs. Here’s a simple example of how these situations play out. 1. A valid contract existed. In order for you to even start a breach of contract suit, you must be able to show that a valid contract existed between you and the other party. If you have a written contract that has been signed by both parties, then this is relatively straightforward. However, if you only had a verbal agreement or some other handshake agreement with the contractor (which may still be valid contracts), you may have a more difficult time proving the existence of an enforceable contract because it is not written down. 2. You performed your obligations. In order to succeed in a breach of contract action, you must be able to show that you held up your end of the bargain under the terms of the contract. In this situation, you paid the money to the contractor. This qualifies as fulfilling your obligations. 3. The other party did not perform their obligations (breach). It seems pretty straightforward that in order to win a breach of contract suit, you must prove that the other party breached the contract, meaning that they did not do what they promised to do. Here, you will need to show that the contractor did not complete the bathroom renovation. Compensatory damages aim to put the non-breaching party in the position that they had been if the breach had not occurred. Punitive damages are payments that the breaching party must make, above and beyond the point that would fully compensate the non-breaching party. Punitive damages are meant to punish a wrongful party for particularly wrongful acts, and are rarely awarded in the business contracts setting. Nominal damages are token damages awarded when a breach occurred, but no actual money loss to the non-breaching party was proven. Liquidated damages are specific damages that were previously identified by the parties in the contract itself, in the event that the contract is breached. Liquidated damages should be a reasonable estimate of actual damages that might result from a breach. In the case of the vacationing contractor, you may need to hire another contractor in order to complete the job that the first contractor failed to do. This would be a compensatory damage. In addition, if you incurred expenses bathing elsewhere, you would want to show those costs as well. Again, this would be another compensatory damage—a damage to fully compensate you for your out of pocket expenses as a result of the breaching contractor. Sometimes damages are inadequate as a legal remedy. If the vacationing contractor were the only one capable of finishing the bathtub, you would want him to come back to work and do the job. If damages are not an adequate legal remedy, the non-breaching party may seek an alternative remedy called specific performance. Specific performance is best described as the breaching party’s court-ordered performance of duty under the contract. Specific performance may be used as a remedy for breach of contract if the subject matter of the agreement is rare or unique, and damages would not be sufficient to place the non-breaching party in as good a position as they would have been had the breach not occurred. Although you may be able to prove all the elements of your case, it is still not time to head to the courthouse. In the American legal system, many more cases and controversies are settled before court than are those cases that are litigated to conclusion. Often times, the best solution to a problem is to simply sit down with the other side and talk about the problem to see if a resolution can be reached without resulting in court action. Additionally, mediation services have become quite popular and prevalent, and free and low-cost mediation can often be found in major cities. Mediation is a great way to have a neutral, third-party sit in on a conversation and suggest ways that a problem could be solved. In fact, you may even be required to try mediation or arbitration before heading to court if your contract contains an arbitration clause requiring the parties to attempt to mediate or arbitrate a dispute before filing lawsuits. Similarly, many courts encourage parties in a lawsuit to mediate their differences before setting an actual trial date. One last thing to consider before filing a breach of contract lawsuit is your ability to collect money from the defendant if you are successful. This might feel like putting the cart before the horse but it will do you no good to win a lawsuit against someone that has no possible way of paying a monetary judgment to you. Being right and having a strong case will not fix your situation or pay your court fees. Courts only have the power to tell you that you are legally entitled to a monetary judgment—you receive a piece of paper at the end of the lawsuit saying that you won and the other side owes you money. This piece of paper is called a “Judgment.” The court will not collect the money for you. If the opposing side is not willing to write you a check, then you have to collect the money through various legal processes. Lawyers can assist you with this process. To demonstrate a possible solution using our bathroom renovation example, if you obtain a judgment against the contractor and he refuses to pay, you have a number of options. If the contractor is personally responsible for his business, you may be able to garnish his wages or place liens on his property. In addition, if the contractor is licensed, you may be able to get the state licensing board to revoke his contractor’s license until the judgment is satisfied. After considering all possible courses of action to collect, it may or may not be in your best interest to file a lawsuit. In short, it is definitely recommended to consult with an Arizona business attorney when you are considering breach of contract litigation. Remember that the example of the vacationing contractor was a simple one. There are often complicated issues regarding where you are even allowed to file the lawsuit, or the timing of when you may file the lawsuit. Also, in Arizona under many circumstances, the prevailing party is entitled to reasonable attorney’s fees and costs associated with litigation that arises out of a breach of contract. Furthermore, contracts are often the basis of valuable, ongoing relationships, and so settling a dispute in a way that’s mutually agreeable to both parties can help preserve the relationship that could potentially benefit both parties in the future. Each case comes with its own unique facts and circumstances and the applicable laws and statutes at play may impact the manner in which you want to proceed with resolving your problem. An experienced attorney can help guide you with a roadmap of the best options available to you.